Looking to hold . . .
A day or overnight camp? 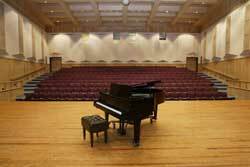 Check out what Neumann University Conferences Services has to offer. Looking for a retreat-like atmosphere for your meeting? 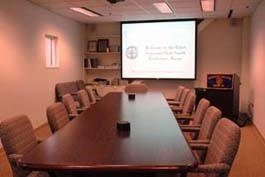 Neumann University has 1,800 square feet of meeting space conveniently located in the Rocco A. Abessinio Building. Included in this space are four modern meeting rooms equipped with board tables, audio-visual capabilities, and easy access to vending machines and restrooms. In addition, an executive dining area is centrally located among these rooms, allowing for easy and convenient breaks. This area allows for coffee and refreshment breaks, as well as luncheons and banquets. All catering is done by our Sodexo Campus Services staff. Find out more about our room capabilities, dining options, and audio-visual equipment here. Looking for a comfortable environment to host your bridal/baby shower, or similar event? Look no further. Neumann University has three rooms to accommodate your needs. The McNichol Room is located in the Thomas A. Bruder, Jr. Life Center. This room is equipped with overhead lighting, projector, projection screen, and computer with internet access. Accommodations can be made for groups of 10-50 people through a variety of set-ups. The Schmidt Multipurpose Room is conveniently located in Living and Learning Center I. This room accommodates up to 70 people and can be set to your preference. Floor-to-ceiling windows, overhead lighting, a full kitchen, and a new sound system are just a few of the many benefits of this room. All events can be catered through Sodexo Campus Services or guests may supply their own refreshments. Please ask our staff about table and linen options, as well as decorations. The Health and Wellness Center is located on the second floor of Living and Learning Center III. This is the perfect room to host gatherings of 10 – 60 people. Choose the set up of the room that best facilities your group’s needs. Will you need catering services? Please let us help. For your convenience, a full kitchen is available for your use. In addition you will have access to our brand new sound system as well. If you are interested in holding a summer camp we are the place for you! The Mirenda Center for Sport, Spirituality and Character Development is Neumann University’s newest facility featuring 72,000-square-foot of flexible use space. The main gymnasium is designed not only for recreational and game activities; it can be transformed into space for commencements, convocations and meetings. A unique component of The Mirenda Center is the 6,800-square-foot Community Hall, a multi-purpose facility for groups the University serves from Aston and the surrounding Delaware County Community. The Mirenda Center is also equipped with a smart classroom that will seat 40 people. This room is ideal for a seminar and other types of presentations. Whether you are staying for a week or just looking to hold a day camp, look no further. We offer beautiful new residence halls of varying styles including suite set up and apartment-style living, as well as traditional residence hall rooms. The Fred P. Meagher Theatre is a modern, fully equipped, 300-seat theatre which can provide excellent facilities for lecture, drama, cinema, concerts and other theatrical events. It houses a large stage, costume and dressing rooms with rest room facilities, a projection room which includes state of the art lighting and sound system, as well as workrooms with large access doors for theatre use. Lectures and meetings can benefit from comfortable table arms, excellent acoustics and a variety of multi-media services, as well as continental seating for comfort and visibility. Additionally, food service is provided in our dining hall, with three convenient serving times. Food can be served buffet style, boxed lunch style, or a la carte, depending on the needs of your group. Additionally, catering is available to your group whether it is a late night pizza party, or an end of the week awards dinner. All buildings are air-conditioned and patrolled by Campus Security 24 hours a day. Neumann has four athletic fields for your use, as well as a full gymnasium. Also on campus are 20 classrooms, and four (4) computer labs. So whether your camp is athletic, or educational in nature, we can meet your needs.